I meant to sit down and write a books post today, but I have been distracted, and in the most enjoyable way. Last Christmas Eve, I mentioned in a post that I love the album ‘An Evening With Bach‘, by the American early music ensemble, Voices Of Music. Since I made that post, they seem to have revamped their website, because it now hosts a video playlist of over 130 high definition videos of their recordings. Sadly, Schlummert Ein, the aria from the cantata Ich Habe Genug, that I love so much, is not among them, but you can listen to it here, if Magnatune’s website is behaving, which it often is not. In the warm embrace of my arms. To depart from here with joy. 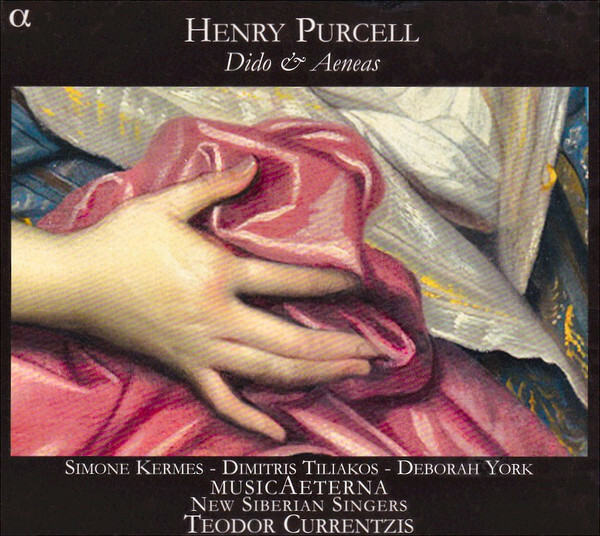 The video posted above is of Dido’s Lament, from Dido and Aeneas, by Henry Purcell. The recording of the opera I favour is the 2008 CD featuring Simone Kermes, which appears to have had a reissue last year, with a moody new cover image. I prefer the earlier one. Anyway, just for comparison’s sake, I’ve embedded a copy of Kermes’ performance below. I didn’t choose the picture, BTW. Entirely unrelated to her corsetry, I think Kermes has a remarkable, unique voice, and her phrasing seems to me naturalistic in a way very few operatic singers achieve. Thanks to Dido and Aeneas, I have become a fan, and have bought the CD of her recording of Blood Wedding: a setting of Lorca’s play by the Danish Composer Hans-Erik Philip. It is beyond lovely. A highlight is embedded below. Anyway, all this fanboyishness doesn’t take away from my enthusiasm for Anna Dennis’ performance with Voices of Music, which I think is spectacular, particularly as the orchestration is probably much closer to what the seventeenth century audiences at the court of Charles II would have heard. I’d encourage you to click on the link to Voices Of Music’s website, and let their videos play through good speakers. Look out for David Tayler’s lute performances and, in particular, his accompaniment to Phoebe Jevtovic Rosquist’s effortless performance of John Dowland’s Flow My Tears (Lachrimae). It’s another beloved piece of music that this remarkable group give new life. Book reviews will have to wait. We have had a glorious summer. Going back through the photos on my phone, picture after picture shows a dazzled world: clear blue skies; smiling, tanned friends; sunlight lancing through rich green foliage or glinting, blindingly off sea or lake. Tia, the golden dog, features in many of them, and she, as much as any other element in my life, has helped to make this a summer whose memory I will treasure. How memories last is one of the mysterious revelations of middle age: the extent to which what we have experienced descends into a soup of glimpses and sense impressions that lose their sharp edges and become blurred. I suppose that is why I blog, or a large reason for it at any rate. Already, I cannot quite remember what I was doing when I took the photo above, of Tia asleep in our back garden. I suspect it was during one of the long afternoons when I was sitting outside, drinking tea and reading crap science fiction, enjoying the sun with Charles Mingus on my headphones. That has been a key part of this summer for me. I must post about the books I’ve read; the music that has shifted from new excitement to established favourite over this wonderful, sun-drenched year. I should also, I suppose, record my achievements over this summer. I have completed a university access course, in science, technology and maths: a major milestone for me. I have, with Amanda, enjoyed the maturing of our relationships with our Labour Party comrades on the Island: in June, I went up to London for the SaveOurNHS march, and, with my sister, we attended the Burston School Strike Rally at the beginning of September. At work, the last academic year was my most successful so far, both in terms of results and the sense that I had helped several of my learners to move on with their lives, opening up new opportunities for them. It has also been a summer of uncertainty. My father’s lymphoma has reasserted itself, and his treatment has shifted from fighting the illness to a more palliative-focused care. We have been up and down to Suffolk, and he has been, on some visits, frighteningly unwell, and on others, his old self, if diminished, physically. One afternoon, I sat in my parents’ garden with him, reading and chatting, warmed by bright sun, and I feel now a desperate need to grab at this memory; to preserve the comfort of being with my father, to record his anecdotes and loving enthusiasm. I am beginning to feel old, but, at the same time, I’m swamped by feelings of never having grown up at all. When Amanda opened the blinds this morning, the world outside was blanketed by fog: our first Autumn mist of the year. From the river, half a kilometre away, the ferry’s foghorn lowed. Signs of autumn have been settling throughout September, of course. We have had the heating on a few nights over the last week and I have been wearing long-sleeved tops, instead of tee-shirts, when I cycle or walk. Thanks to Tia, I have watched the passing of summer in Firestone Copse, as the blackberries fruited, ripened and, now, are beginning to wither on the brambles. A fortnight ago, there were still mushrooms all round the woods, layered on tree stumps and poking through the undergrowth, but they are, for the most part, past now; either gone completely or looking wrinkled, slimy, deathlike. Yesterday evening, in wonderful autumn sunset weather, I saw the first major turn of leaf colour, and was walking over fallen leaves for the first time his year. I took Tia off the main path, across a hidden bridge on the path that, after the winter rain sets in, will be inaccessible, as it was all last winter, When I reached the top of the last descent to the creek, the sunlight off the water screamed up at me through the woods, white and fresh, rather than yellow and warm, as it has been through the summer. A man was at the creek edge, by the bench, throwing stones into the water for his dog to chase. Tia, who doesn’t like swimming, waded along the shallows, barking at the other dog to come and play, but not quite able to summon up the courage to throw herself in and join in the fun. Later, I bumped into two friends who were having an after-work walk. It was a lovely surprise, but threw me out of my dream: my woods-peace. I had hoped to make it back to the main path in time to see the low sun on the bank that rises up from the path, but we talked for a little too long. By the time we made our way back, the sun was set and twilight was setting in, the woods off the path turning dark, with the sense that life was stirring within. Tia had become bored, waiting for us, and disappeared, causing anxiety and shaming me. Eventually, as the shadows on the path were turning from chocolate to black, she came bounding out of the woods, tongue lolling out of her excited grin, as if butter wouldn’t melt, and we came home to a delayed supper and annoyed wife. And so to this morning. I am working late today: my last class finishes at eight-thirty, so I don’t have to start until midday. Thus, we lingered in bed and I got a second pot of tea; a luxury usually reserved for the weekend. I put on the kettle and opened the blind above the sink to see a forest of webs over the denuded jasmine outside the kitchen window. I grabbed my phone and went outside to get photos. The paving slabs were cold beneath my bare feet, the air damp and fresh, the stillness of the fog enclosing me like a shelter. Something sharp, joyful and clear will be remembered, when the irritations, fears and sorrows of this time in my life are swallowed by the passing of time. The blessedness of living through nature’s greatest truth is shaping this period in my life: the inevitability of change, and the awareness that that is life’s brightest magic. Anything I say about this speech would be inadequate. It is sublime. Watch it, read it, remember it. Chair, Conference, it’s a privilege to be opening this debate on behalf of my good friends Nia Griffith and Kate Osamor, their shadow teams, including Liverpool’s own Dan Carden, and my own superb ministerial team: Liz McInnes, Khalid Mahmood, Fabian Hamilton, Helen Goodman, Ray Collins, and my PPS Danielle Rowley. And it’s wonderful to be back in Liverpool: a city we really thought couldn’t get any more Labour, but where last year, we won 37,000 more votes than in 2015, our biggest ever vote in this city. And next time round, under the inspirational leadership of Jeremy Corbyn and John McDonnell, we’ll go one better. It’s been 35 years since we kicked the last Tory MP out of Liverpool. And next time round, we’ll win Southport as well, and kick the Tories out of Merseyside for good. Conference, as we all know, this is a year of important anniversaries in the history of the socialist movement – a movement always based on the unstoppable momentum of the masses, the incredible inspiration of courageous individuals and a core belief that injustice done to any of us is injustice done to all of us wherever we are in the world. And in this year of anniversaries, we start by celebrating 150 years of the TUC: 150 years spent fighting for workers, not just in Britain but all across the globe, and stronger than ever today thanks to the leadership of Frances O’Grady, and thanks to a Labour leadership which now respects the representatives of our workers, rather than treating them with deliberate contempt. And in this year of anniversaries, Conference, let’s recall it’s 130 years since a thin, humble, bearded socialist – it’s funny how those men can change the world – a Frenchman called Pierre De Geyter sat down and wrote a new melody for some old lyrics, and created the song we know as ‘The Internationale’, which inspired the working class of Europe and shook the ruling class, because it rejected war, rejected exploitation, and urged the human race to unite. And of course, conference, it’s 100 years since the first women in our country won the right to vote and won the right to stand for Parliament. And don’t let anyone ever say that we were ‘given’ those rights, because the women who came before us weren’t given anything! They fought for those rights, they suffered for those rights, and some died for those rights. And everything we now enjoy was won for us by those brave, brilliant women. But it’s also 100 years, Conference, since a young woman who never got the right to vote gave birth to her only son: a son who was refused permission to attend her funeral 50 years later because he was in a prison cell on Robben Island. Nosekeni Mandela never got to see her son freed. She never got to see him change his country and inspire the world. But he called her “the centre of his universe” so we owe it to her that he did. And Conference, we also this year celebrate the anniversaries of some of Labour’s greatest achievements: 70 years since the Attlee Government created the NHS; 50 years since the Wilson Government helped create the Nuclear Non-Proliferation Treaty; and 20 years, Conference, since Gordon Brown brought in the Tax Credits which the Tories are trying to dismantle; 20 years since Tony Blair secured the Good Friday Agreement which the Tories are trying to jeopardise; and 20 years since a Labour government started the Devolution Revolution which the Tories are trying to ignore as they hurtle towards a false choice between the ‘Chequers Deal’ and ‘No Deal’, either one of which will kill jobs and growth all across our country, and neither one of which we will accept. But Conference, it is also a year of solemn anniversaries. 100 years since the end of the First World War, when young men from every corner of the human race united across Europe, Africa, The Middle East and Asia, not in the spirit of The Internationale, but – in the words of Keir Hardie – “to fill the horrid graves of war” in the name “of selfish and incompetent statesmen” who had failed to preserve peace. And it is 70 years too Conference, since the assassination of Gandhi and 50 years since Martin Luther King and Robert Kennedy: three men of peace, three men of hope, all shot dead because they believed in an alternative to violence and hatred and war. And there is a final anniversary we must pause and remember today. Because Conference, it was 80 years ago this very week that the International Brigades were disbanded after their brave struggle against fascism in Spain, and their heroic final stand at The Ebro. And we pay tribute today to those brave men and women, including one of this city’s greatest sons, the legendary Jack Jones, who were prepared to sacrifice their youth, their futures and their lives to try and stop the rise of fascism in Europe. And we need that same spirit today, Conference, because make no mistake, those dangerous forces are on the rise again in our world on a pace and scale not seen since the days of the International Brigades. And it is not just the scenes from Charlottesville to Stockholm of masked thugs marching under Neo-Nazi Banners. It is also – far more dangerously – the rise of leaders projecting a form of nationalism not defined by love of one’s country and one’s people, but by hatred towards everyone else; by the erosion of democracy and free speech; and by the demonisation of any minority, any religion, and indeed any media outlet deemed to be ‘the enemy’. And everywhere we see those governments today, we know they are contributing to the creation of a world which is the opposite of The Internationale’: a world where the human race is more divided, more drowning in hatred than at any time since the 1930s. And a world which is therefore utterly unable to deal with the problems that we all collectively face. That is why our world leaders shrug their shoulders as the Climate Change crisis reaches the point of no return. That is why governments like ours continue to sell arms to Saudi Arabia even when it is proven that those weapons are being used to murder innocent children in Yemen. That is why the war in Syria too remains so intractable and destructive, with the dozen major countries involved not striving to stop it, but playing their own lethal power games with other peoples’ lives. That is why North Korea can happily continue developing their bomb; Iran can keep Nazanin jailed for a third year; Myanmar and Cameroon can slaughter their own citizens at will; Russia can act with impunity not just in Syria but in Salisbury; and Donald Trump can tear up treaties it took other leaders years to agree. All because Conference, the world order has been turned into a global free-for-all, and the leadership to fix it is simply not there. But Conference, it’s here in this hall, it’s here on this stage, it’s here in Jeremy Corbyn. And we as the Labour Party in government must strive to lead the world in a different direction. So with Nia Griffith’s leadership, we will support our forces, maintain 2 per cent spending on defence, invest more in peacekeeping, respect our international treaties, and never hesitate to defend ourselves, our allies, and our citizens abroad. But equally, we will never as a party go back to supporting illegal, aggressive wars of intervention with no plans for the aftermath, and no thought for the consequences, whether in terms of the innocent lives lost or the ungoverned spaces created within which terrorist groups can thrive. And with Jeremy Corbyn’s leadership, we must and will lead the world in promoting human rights, in reforming the arms trade, in pursuing an end to conflict, in supporting not demonising refugees, and in turning the promise of a nuclear-free world from an impossible dream to a concrete goal. And with the leadership of every single one of us, Conference, we must also honour the memory of the International Brigades, and lead the fight against the forces of fascism, of racism, and prejudice, and anti-semitism. Because that is what we have always done both at home and abroad, and that is what we must always do. We were there in Spain fighting Franco in 1936. We were there in Cable Street that same year fighting alongside the Jewish community to stop the Blackshirts. We were here in Liverpool a year later, when Oswald Mosley tried to speak in this great city and was forced out without saying a word. And we were there in the 1980s – I was there myself – when we marched against the National Front. And let’s remember Conference, we won all those battles! We beat the Blackshirts, and the NF, and the BNP, and the EDL, and whatever they call themselves today, however they dress up their racial hatred, we are there in the same streets telling the fascists: ‘No Pasaran’. And when we look back on all those battles, stretching back 80 years, I make a simple point, it hasn’t been thousands of Tories assembling in the streets to fight the forces of fascism. It’s been the men and women in this room. It’s been Jack Jones and Jeremy’s parents. It’s been Jon Lansman and Len McCluskey, Diane Abbott and Dawn Butler, Jeremy Corbyn and John McDonnell. So while I make a point of never disagreeing with John on anything, I disagree with him on this: we don’t need a new Anti-Nazi League, because the Anti-Nazi League is in this hall and on this stage. But Conference, let me speak to you from the depths of my heart and my soul and say something I never thought I’d have to say in my lifetime as a Labour member and activist, and it is simply this: that if we want to root out fascism and racism and hatred from our world, and from our country, then we must start, we must start, with rooting it out of our own party. We all support the Palestinian cause, we are all committed to recognise the Palestinian State, and I stand here with no hesitation when I condemn the Netanyahu government for its racist policies and its criminal actions against the Palestinian people. But I know as well, and we must all acknowledge, that there are sickening individuals on the fringes of our movement, who use our legitimate support for Palestine as a cloak and a cover for their despicable hatred of Jewish people, and their desire to see Israel destroyed. Those people stand for everything that we have always stood against and they must be kicked out of our party the same way Oswald Mosley was kicked out of Liverpool. And Conference, there is something more. Because if we truly want to realise the dream of The Internationale to unite the human race, and re-unite our country, then again we must start with uniting our own party, and ending the pointless conflicts which divide our movement, which poison our online debate, and which distract us from fighting the Tories. Because as Gandhi said: “We but mirror the world so if we could change ourselves, the world would also change.” But if we can’t show the strength to change ourselves to change the way we behave to each other, how can we ever hope to change the country, and aspire to change the world? But if we can do all that, just think what we’re capable of. Think what history we can create in government. Think what we can achieve that future Labour Conferences will remember as great anniversaries. “Iron clad boots”, she said, “Men marching silent, severe, with rifles on their shoulders and bayonets fixed, making the earth tremble under their feet.” She and others crouched on balconies overlooking the street, rifles cocked and grenades ready to be thrown, just waiting for the order to attack. But then she said, the army began to sing. “A thrill goes down the spines of the people, `Is this a dream?’ ask the women, sobbing.” But no, it was not. The men marching down the street had begun singing ‘The Internationale’, each in their own language – French, Italian, German, and English – the men of The International Brigades, all singing different words, but all with the same meaning, that when any of us is under attack from the forces of hatred, prejudice and exploitation, we are all under attack and we must unite and fight back together. And if we can show that same unity today in our party, if we can root out prejudice and end division in our own ranks, then we can heal our divided country, we can unite our fractured world, and we can show that the greatest achievements of our socialist movement lie not in our past, but in our future. That is the kind of government we need for our country and that is the kind of Britain we need for our world. A few weeks ago, it would have sounded realistic to say that Labour was bogged down in internal process and losing momentum, at least if you only read the Guardian or listened to the BBC. In fact, that has never been the case: the membership figures continue to grow and several of the ‘issues’ on which the media have focused have at no time been static, but have been worked through logically and profitably. However, we all go into this week’s conference with raw nerves, worried that the tensions over the democracy review might blow up into a fight, or that anti-semitism accusations might drown out principled debate. I am hugely relieved to have watched the first few hours of the conference and seen a flawlessly confident party structure absorbing the tensions, addressing the issues head-on and showing a sensitivity to the wide range of voices within the party while keeping the focus determinedly on what really matters: challenging the Tories’ brutality and corruption and preparing to win the next election. The closest we’ve had to a scandal so far is a distortion by The Guardian of Dawn Butler’s excellent speech to Women’s Conference, in which she referred to the brave history of resistance within Liverpool’s socialist past, which they tried to spin as a call to Labour councillors to break the law. Quoting Progress members (the Blairite pressure group within the party that forced through New Labour’s ‘reforms’, such as the dropping of the commitment to public ownership, in the nineties, and turned Labour into a Tory-Lite capitalist party), the Guardian article tries to raise spectres of Trots cheering city councils to ruin. Of course, Butler did nothing of the sort: it was a reference to the fact that local government cuts are direct assaults upon the poor, embedded in a speech of celebration of the achievements of the Labour Party over the last few years and a rousing call to be ready to campaign against the heartless government which uses those cuts as a weapon against vulnerable people. This morning, in the main conference, there was some contention over the vote to accept the Conference Arrangement Committee report, as the schedule disadvantages CLPs by not allowing much time to argue over the Democracy Review, which was only published yesterday and supplied to delegates this morning. Eight or nine delegates tabled objections, which were acknowledged promptly, and the CAC report accepted, narrowly, so the Democracy Review debate began on schedule. I would have been happy to see it delayed, in the interests of delegates going into the debate fully prepared, but the debate seems to be lively and informed anyway. This does not look like a micro-managed showpiece conference, of the sort we became used to in the Blair years: this has substance over style. Ably chaired by the very good-humoured Andy Kerr, this morning’s session, as far as I have watched it, has stayed on track while permitting debate and dissent. Neither, though, does it look like a return to the eighties, where angry voices brought proceedings to regular bitter impasse over their chosen (usually procedural) issue. There really is a sense of unity: the speakers are speaking the same language as the delegates, addressing the issues the delegates are exercised about, because this really is a movement whose leadership are listening to, and being guided by, their membership. The highlight, so far, has been the speech by the new General Secretary, Jenny Formby, whom I met (just long enough to tell her I intended to vote for her) at a Labour Economics Conference in Southampton back in the spring. The vote to endorse her position was unanimous and met with huge cheers. She then gave the speech that I have been waiting to hear for months: a summary of where we are, what we believe, the challenges we face and have overcome, and what we intend to achieve. What struck me about Jenny’s speech was that we are living through another of those moments we saw in 2017, when all the fog, all the rubbish thrown at Labour by the establishment and the crony capitalists who think that the Labour Party should either become Tory-lite or go away and die in a corner, is swept away by the clarity of thought that a vast group of people, fired by hope, can achieve collectively. Interestingly, it chimes with the message of this article, which I read yesterday morning, by Lorna Finlayson in the LRB. We are on track. We can do this. The chaos the Tories have sown is not the normative position of our rightful rulers, but a perverse aberration that has marred democracy for far too long. We can rebuild Britain for the many, not the few, and it looks as though we are going to get the chance. If you’re in the UK, and would like to be a part of the change, you can join the Labour Party here. The live stream of the party conference, along with the highlights so far, is here. A month or so back, a friend of mine who suffers from long-term, severe mental illness was attacked by a group of boys on her estate. They took photographs of that attack and posted them on social media. They are pretty much immune from prosecution, thanks to the ‘viral’ response to their post. Granted, they are now pariahs in their close-knit community, and their ugly, stupid act will follow them into their adulthood, cropping up whenever they attempt to make any public progress in their lives. If you believe in mob-justice, then justice might be said to have been done. The state, however, because of the illegal publication of their identities on Facebook, Twitter and Instagram, is powerless to take action against them. It can only attempt to protect them from the self-aggrandizing vigilantism to which they have opened themselves by their use of social media and their grotesque immaturity. The legitimate, accountable, democratically-authorised legal system has been short-circuited by a foreign-owned capitalist monopoly that uses the everyday indignities of humanity as grist to its algorithms and regards legal and democratic structures as barriers to wealth creation and the self-actualisation of the cleverest, luckiest and most amoral elite in history. I saw my friend last weekend. She is terrified. She is not engaging with the community which piously leapt to her defense after years of treating her as a local embarrassment, and she thinks the police are trying to victimise her: their inability to give her a clear course of legal remedy for her ordeal has confused the issue beyond her ability to engage with it. She is also mesmerised by her Facebook feed, which seems to be confirming her long-standing belief that the world is purposed towards her destruction. Horribly, I think that her fear that the hatred towards the boys will swing back to her may be justified. That is the nature of restless, self-righteous, technologically-enabled groupthink. The rule of law is a mainstay of democracy. Facebook undermines that rule. It is inherently anti-democratic. By the 2017 general election, however, the political promise of the medium had begun to be diminished by forces other than the well-directed groundswell of public feeling that had empowered the Elect Corbyn for Leader movement. I am not an unquestioning fan of Momentum, but I think that the campaign to elect Corbyn as leader was a model of how to use social media to a positive purpose. What they achieved in ‘15 was to break the ‘echo chamber’ or bubbling effect of Facebook and Twitter’s algorithms, by pulling in unsympathetic friends of sympathisers, and engaging them in debate and exposing them to sincere voices of political hope. By the time of the 2016 U.S. presidential election, and by 2017, the social media companies had realised that this was a loophole in their control of users’ media consumption and had adjusted. Before Facebook became a publicly quoted company, focussed on advertising spend, it had been chasing engagement over content control, powering for growth, and there was a certain freedom of expression allowed to its users. By 2016, it was chasing the control of what its users were seeing to a far greater extent, refining their offering to advertisers and data-purchasers and trying to present a soothing, ‘mimetic’ (ie, reflective, flattering) experience to users which would make viewing Facebook a comfortable and reinforcing experience to which people would return without worry. That is why they bubble you. It’s not a service. It’s a mechanism of control. Furthermore, the sophistication of the JeremyForLeader campaign, alongside the Occupy movment and the lessons learned from The Arab Spring movements, had caught the attention of other forces, both within the U.K. and outside it. Academic studies translated to media management policies which were adopted by right-wing forces and foreign intelligence services to undermine the impact of organised popular campaigns. Populism swings in many directions. In short, the glory days are over for democrats who use social media. An open technology -the internet- that was designed to release knowledge, communication and democratic access from the establishment gatekeepers who had directed public debate since at least the 1850s, has been co-opted by a new capitalist, plutocratic, neo-liberal elite, to bind its customers into a tower of Babel, in which coherent exchange of ideas is anathema, labelled as TL:DNR. Know this: a private Facebook group is not private. It is exclusive, in that the labour put into it is restricted to those who choose to sign up to it. This means that it serves as a mechanism of exclusion of those people who, for whatever reason, choose to not participate in social media. However, that ad hominen rant against a comrade to which you succumbed during the Owen Smith leadership challenge is available to the right level of advertiser, if they’re searching for dirt on the Labour Party during an election campaign. And that situation assumes that you’re wise enough to restrict your rants to a ‘private’ group, and to not share your breathless prose in a moment of vainglory to your main feed. Or that all the members of the group have the best wishes of the party at heart. Or that the administrators have kept up with the constant changes to Facebooks privacy rules, and that the group is still actually set to ‘private’, rather than just ‘closed’. Or that no one is taking screenshots for malicious purposes. But you know that, really. How else do the rumours of ‘green infiltrators’ get started? Unless you delete your account -not just a single comment, but your whole account- and forego logging back into it for two weeks after you have deleted it, everything you have ever uploaded, written, sniped or ‘shared’, is sitting in a folder on Facebook’s servers, available to the highest bidder, and linked to you. Have you ever enjoyed watching someone try to backtrack on an opinion they expressed five years ago in a drunken moment? It could be you. Only the safety of the crowd protects you. There is a rather mischievous argument doing the rounds in internet freedom circles that claims China actually has more politically effective internet access than the free West. I consider that nonsense: Chinese citizens have definitely scored real successes in changing government policy through internet activism, but they’ve been pretty well educated in staying away from economic, central government and foreign affairs topics. However, the state is not the only enemy of freedom, and in the West, it is not even the most powerful. Facebook, in fact, is the biggest surveillance-based enterprise in the history of mankind. It knows far, far more about you than the most intrusive government has ever known about its citizens…Your eyes are directed towards the place where they are most valuable for Facebook. The sight of large chunks of a socialist party beavering away, providing free labour to create content for a few American monopolist corporations fills me with despair. It is as if the Chartists had had their discussions about citizens’ rights in the tearoom of the House of Lords. In the light of what we know about how Facebook played (or, as they claim, were played, during) the last American presidential election, we should understand that they have worked out how to neutralise justice movements’ energy and commitment. They want to keep you happy, yes; that is why there are cat videos, but angry people click as well, and division is incredibly easy to sow, if you know where to lay the seeds, and you own the field. Know this also: social media, particularly Facebook, is as much a product of manipulative psychological theory as it is a product of technology. Zuckerberg actually pursued a dual degree at Harvard: Computing and Psychology. The mechanisms written into Facebook behavioural algorithms are rooted in the theories of conditioned response which underpin the most nakedly dishonest branches of marketing, propoganda and behavioural control. The desire for a ‘like’ or a notification of any kind on a social media app or browser window, is the same conditioned twitch seeking content-free reward as is used by the designers of gambling machines. It is the behaviour of the rat that has been trained to associate a button with pleasure and will starve to death seeking the signifier of that pleasure, even when the actual reward has been removed from the process. Von Clausewitz said that armies lose when they try to re-fight the last war. The limited, almost-victory of the 2017 election was successful, as far as it went, not because of social media, but because Labour concentrated on what mattered: having control of its content and being clear about what it stood for. The brief flowering of commercial social media as a medium of democratic liberation is over. We need to create our own fields. We need a CLP Facebook feed, but it should be treated as a shop window, only being populated with content approved by the CLP, in a professional manner: another method among many to spread our Labour ideals to the public. It should be curated, nurtured and controlled. We do not need a public kvetching arena, which is what our ‘private’ Facebook group is. Get off Facebook. Start creating our own discussion groups on secure media that we own: Diaspora is a good first step, but a Rocket chat server would be more instinctive for most users and would be easy to set up, and cheap to run, and we would own it in a way we would not own a Facebook page. It would also be free of the pressure to keep up, to keep chasing the approval of an algorithm. It would remove the competitive fury inherent in social media slavery, and it would allow us to discuss again, instead of constantly arguing. Miller, Patrick R., et al. “Talking Politics on Facebook: Network Centrality and Political Discussion Practices in Social Media.” Political Research Quarterly, vol. 68, no. 2, 2015, pp. 377–391. JSTOR, JSTOR, www.jstor.org/stable/24371839. The Link above is from Pride’s Purge, a satirical blog that is doing what British media, on the whole, fails to do by looking the sheer evil of the British establishment in the eye. I’ve embedded the letter at the end of this post. In April 2017, McVey was selected to succeed George Osborne as the Conservative candidate for the June 2017 general election in his safe seat of Tatton. She was elected, with around the same vote share as Osborne gained in 2015 (58.6%), but with a decreased majority. In a reshuffle prompted by Michael Fallon’s resignation as Secretary of State for Defence in the wake of sexual assault allegations, and in which former Chief Whip Gavin Williamson replaced Fallon and his deputy Julian Smith replaced Williamson, McVey was appointed Deputy Chief Government Whip. McVey lives in West Kirby, Wirral. McVey has previously been in a relationship with BBC producer Mal Young, as well as former Conservative frontbencher Ed Vaizey and when in London, she formerly shared a flat in Pimlico with Conservative colleague, Philip Davies, with whom she has had a “long time on-and-off romantic interest” and is currently partnered. The house-sharing arrangement ended when McVey lost her first seat at the 2015 general election. So, she hates poor people, she’s wedded to lies, she’s out for everything she can grab for herself and she has friends in the BBC. She’s the epitome of Tory corruption. Tom Pride’s satirical letter to her is below.